Looking for a quick appetizer to make today? 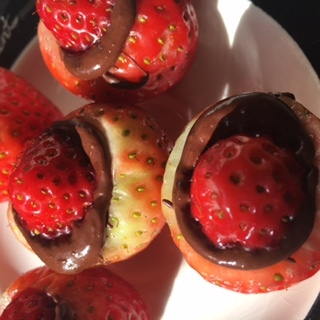 Try a different twist on dipping strawberries in chocolate. Easy. Delicious. Fast. You’ll have enough time to make it as a treat today or an after-dinner dessert if you wish. Strawberry buttons vary from the typical dip-in-chocolate method as you can see from the pictures. Originally, I intended to dip the strawberries in chocolate by using my friend’s daughter’s recipe with cream cheese. We were shopping in Target, and I was looking for the chocolate squares I’ve used previously for chocolate dipping. 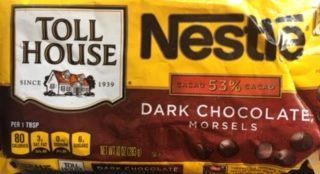 There were none available, so I purchased dark chocolate chips. My friend, Barbara, said her daughter made the strawberries with a cream cheese filling. “Great!” I told her, remembering that I had just picked up cream cheese recently. I was all set. However, when I later was in the middle of slicing my strawberries and melting chocolate chips, I pulled out the unopened cream cheese from the fridge. Herbs and onion! Uh-oh. Herbs and onion cream cheese with strawberries and chocolate didn’t sound very appetizing. All of a sudden, my improvise method kicked in. Barbara’s daughter made yummy strawberries fills with cream cheese (doesn’t that sound incredibly delicious?). I didn’t want to go to the store again that day. 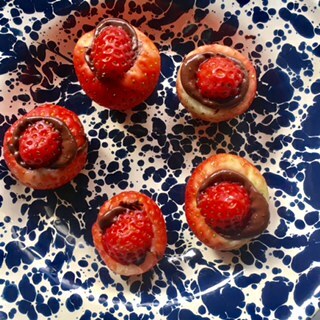 Therefore, I decided on filling the strawberries with chocolate. 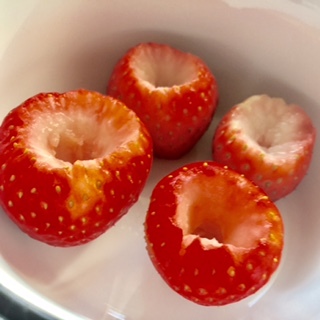 First, I cut the crown of each strawberry. Next, I sliced the bottom tips off so that the strawberries would not fall over when placed on a plate. The chocolate chips were placed into a deep bowl and into the microwave for about a minute, stirred, then back in for another thirty seconds. Fill the strawberries, place the strawberry bottom tips (buttons) on top. Serve like that, or dip in chocolate if you choose. 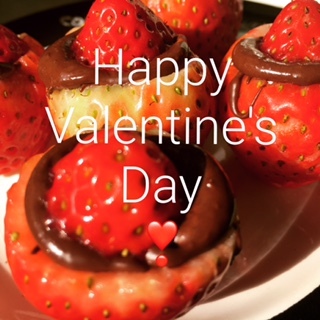 My husband and I had an early Valentine’s dinner and enjoyed the filled strawberries as you see in the photos. 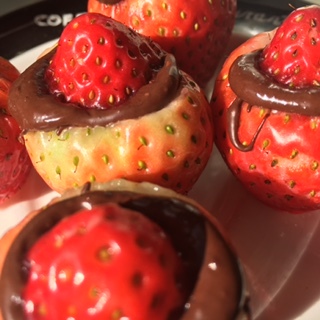 I did dip some in the melted chocolate, but our favorites were the filled strawberries that weren’t dipped in the chocolate. Cut off the bottom tips (buttons) of the strawberries so they can be placed flat onto a plate. Cut the crown of the strawberries off and discard. Melt the chocolate chips in the microwave for about a minute, stir, then put back into the microwave for about another thirty seconds. Fill the strawberries, and place the buttons on top. Voila! If you make the chocolate-filled strawberries, let me know your variations. See more strawberry recipes on kitchenhospitality.com. Next Post: How Do You Like Your Eggs? What an interesting twist on chocolate strawberries! I am glad you noticed the cream cheese was herb and onion before you filled the berrirs with it. That could have been a disaster.